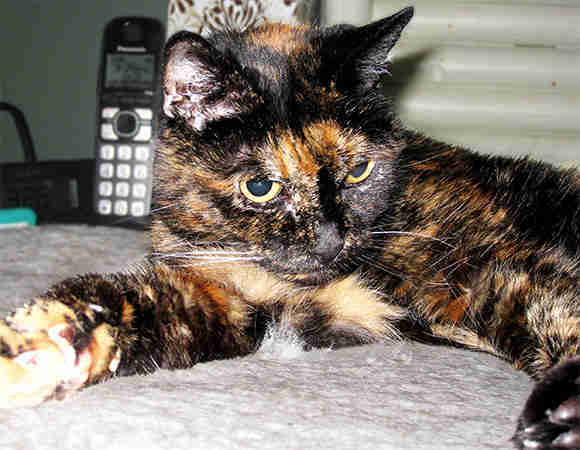 An incredibly sweet tortoiseshell kitty named Tiffany Two has officially been recognized by Guinness World Records as the oldest living cat on the planet, having reached the ripe old age of 26. But despite the fact that she's exceeded her species' life expectancy by more than a decade, Tiffany Two's beloved human says the secret to her pet's longevity isn't some special diet or magical supplement - it's love. "I always say that she's lived so long because she's so completely devoted," Sharon Voorhees told The Dodo. "I have the feeling that she just doesn't want to leave me, and I think there's some truth to that." Voorhees has given the record-breaking cat good reason to be devoted. 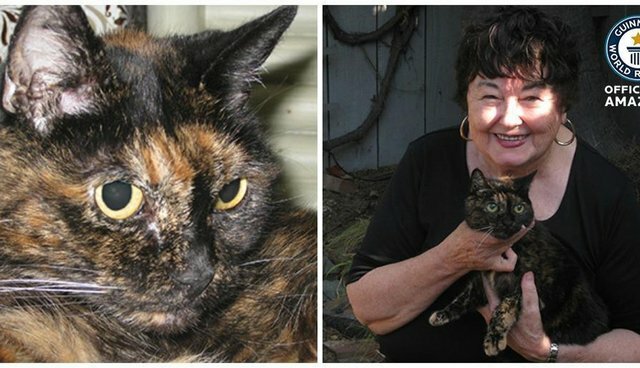 She first met Tiffany Two, whom she named after her previous cat, in 1988 while passing by a pet store near her home in San Diego that was hours away from closing its doors forever. "There was a big sign that said 'Going out of business at 5 o'clock' - and there was Tiffany in a cage," Voorhees said. "I didn't know what would happen to her at 5 o'clock, so as I drove home I just kept thinking about her. By the time I got to the house, I knew I had to go back." She returned to the store just five minutes before it closed. "I paid $10 for her and got 27 years of love," she said. "My best investment yet." Over their many years together, Tiffany Two has proven to be much more than a pet to Voorhees - she's been a loyal friend, remaining by her human's side through thick and thin. "I've always felt that Tiffany is there for me. It's hard to articulate this, but I just have the sense that she knows when I'm not feeling good, or if I am sad. I just have that feeling. She is just always there, you know, to cuddle up to me," said Voorhees. When asked what she's learned most from the decades she's spent in the company of a cat like Tiffany Two, Voorhees says that it's all too easy to forget the role pets play in our lives - and she's had the same one in her life long enough to know that better than most. "I think sometimes we humans are so busy looking at other things that we forget to look down to see the most loving support system in the whole wide world sitting right there at your feet," she said.